Thank you very much, Anthony! I am glad it worked for you. Works perfect on 1.8.3, thank you! how do i reduce the size of the widget ??? Thank you very much, meril! Which widget are you talking about? Oh ... that's strange ... is yout theme over-riding the plugin css? Have you put the iShouvik Profile plugin below your theme? Hmm, what's the overall width of your canvas? Thank you for this fine plugin. While trying it out, I seemed to have some alignment issue. Left column at the bottom shifts to the middle. Am I doing something wrong? urhooks: Sorry. I am not getting you fully. Burda: Most probably, some theme is overriding the css, etc. It works for me with a clean elgg 1.8. * instalaltion. Try adjusting the CSS. BTW, thank you very much for the appreciation towards the plugin, recommendation, sharing goes as an encouragement to release more sophisticated versions and bug-fixes. I'm having the same problem as 'urhooks'. 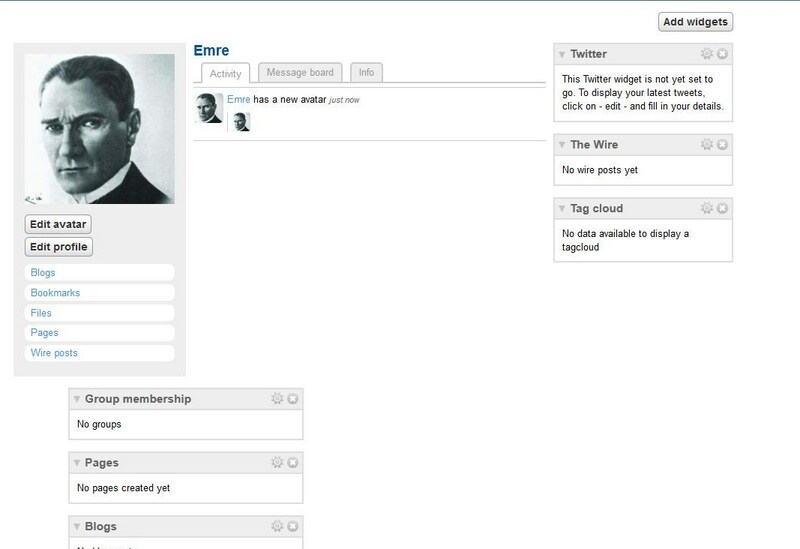 On the dashboard, when you click a member, it redirects back to the dashboard. We need to figure out how to change the profile urls from '/profile/870' to '/profile/username'. @mrunlimited2011: Pleae tell me where exactly are you guys clicking? This plugin doesn't override the dashboard. It only changes the profilepage. You must be using some other PlugIn which is screwing up links to User Profiles from your Member Page Listing. Dhrup: Thank you very much for a better choice of words!! Mikes: Could be a CSS issue because of different Elgg versions ... I am not sure though. Try making some changes on the css width. Great plugin and support. But I have the same problem. How can I set the message board only for friends? Actually, anyone can write there, and I think that my messageboard is only for my friends and I.
Hello, why i cannot see the mesage box on the top of my screen??? How to show "Wire" instead of "Message board" in the second tab?